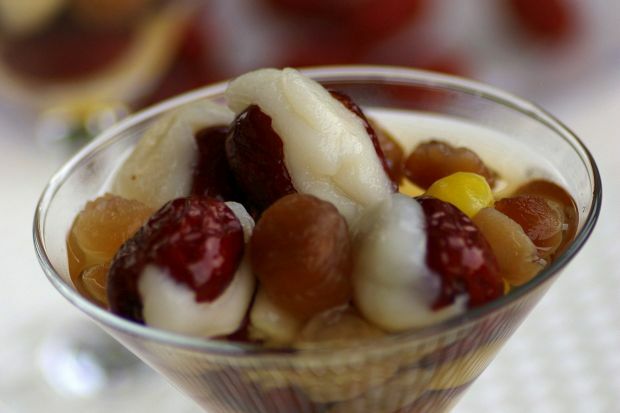 Dates tastes delicious in both savory and sweet dishes. So, here is the recipe for stuffed red dates in salty-sweet syrup. Remove seeds from the dates with a small slit – do not cut through. Soak the dates in water for 15 minutes. In a mixing bowl, combine the glutinous rice flour, wheat starch, sugar and salt. Pour in hot water followed by water, and mix into a soft dough. Pinch a small piece of dough and stuff it into the date through the slit. Press the dough in gently. Bring a pot of water to boil and drop the dates in. Cook for 4–5 minutes, or until cooked through. Dish out with a slotted spoon and soak them in ice-cold water. Bring water and all the ingredients to a boil. Reduce the heat and simmer for 15–20 minutes. Serve the stuffed dates with the syrup.